"By law, no member of the Naval Reserve is permitted to accept employment with the government of any foreign country in a capacity which is directly or indirectly under the control of such a foreign government." - Naval Intel report. Before statehood, Israel's government-in-waiting, the Jewish Agency, assembled a vast clandestine smuggling network in the United States. The network purchased explosives, munitions, manufacturing equipment, fighter airplanes, bombers and other materiel from the War Assets Administration. Some purchases were made through front organizations such as Foundry Associates and Materials for Palestine. For other items, Jewish Agency agents arranged straw buyers from Latin American countries. The Jewish Agency was the creation of American Israel lobby organizations, such as the ZOA and the American Jewish Committee. (Link to JTA archive of report below). Network operatives also stole some items from WAA stockpiles, such as heavy machine guns, or falsified export papers attempting to export state-of-the-art fighter airplane engines. One front operation, Service Airways, purchased export-prohibited military transport planes ostensibly to fly for a Panamanian start-up airline (Lineas Aeros de Panama), but instead delivered them to Jewish flyers to use in combat in Palestine. The following classified Naval Intelligence and FBI files were first sought by researcher and author Stephen Green for his 1984 book "Taking Sides: America's Secret Relations with Militant Israel." Thirty years after he sought them, and nearly seventy years after they were written, the National Archives and Records Administration declassified them under a 2010 Freedom of Information Act request (release letter PDF). The files are interesting for their glimpse into strategies and tactics Israel lobbying organizations would use to escape consequences in later confrontations with law enforcement—claiming not to know the "big picture," conducting key illegal activities offshore, and trying to hide clandestine operations money trails. The files also indicate how law enforcement tactics such as informant development, mail and communications monitoring, and multi-agency information sharing helped provide a fuller picture of Israeli espionage on U.S. territory and foreign countries such as Panama and Czechoslovakia. Despite financing the smuggling operation, the Jewish Agency and its New York legal representatives never faced any criminal charges. The Jewish Agency was found by the Justice Department and Senate in the early 1960s to be funding the American Zionist Council/AIPAC. The Justice Department ordered the AZC to register under the 1938 Foreign Agents Registration Act. When American activists finally forced the Jewish Agency's American Section to file its secret covenant with the Israeli government, the Jewish Agency's American Section staged a paper reorganization (characterized as "sketchy" by the U.S. Department of Justice) and reemerged as the American Section of the World Zionist Organization. According to a Congressional Research Service report (PDF) by 1973 the Jewish Agency began receiving $25 million a year in U.S. taxpayer funding for refugee resettlement and other activities – totaling $460 million by 1991. CRS reveals that between 2000 and 2013 the Jewish Agency received another $534 million ($41 million per year) in funding from Congress – none of it easily auditable by U.S. taxpayers. DOCID-31983379.PDF 35 MB A 4/28/1948 U.S. Naval Intelligence report on the Jewish Agency's attempted illegal export of 42 combat military aircraft engines. Service Airways front organization cover stories about Panama and Spain service. Intel on Adolph "Al" Schwimmer "did no desire that any representatives of the Arab nation should receive the information." "He believes that the Jewish Agency is supplying all money for the transaction." "Stated that he was a bit disturbed about the recent news of the shipment of TNT to Palestine." Schwimmer's attempts to buy P-51D fighter aircraft with "machine guns intact", "Source #9 advised that he heard from a reliable source that Schwimmer was backed by a large organization of rich Jews in New York City. Contacts in Panamanian Aeronautics director. Purchase of M3 demolition blocks. Naval Intelligence cooperation with federal law enforcement. DOCID-31983542.pdf 7 MB SAC report to FBI director on 7/20/1948 about Naval Intelligence findings. FBI sources Mrs. Templeton Taylor and Mrs. Fred Dahms concerns about their husbands corroborate undercover smuggling activity reports from Czechoslovakia. Attempted export of 42 combat military aircraft engines. Al Schwimmer states "he has kept all information confidential inasmuch as he did not desire any publicity be given the fact that the Jewish Agency was purchasing airplanes in the United States, and that he specifically did not desire that any representatives of the Arab nation should receive the information." "Adolph William Schwimmer purchased three war surplus Constellation planes for Albert Miller, representative of the Jewish Agency for Palestine....Albert Miller was associated with Leonard Weisman of Foundry Associates, Incorporated, who was involved in the purchase of M3 demolition explosives from the War Assets Administration for ultimate shipment to Palestine. Service Airways acquires 23 Curtis Commando aircraft. Transfer of planes from Panama to Italy, Panamanian front rolled up after all planes leave. List of pilots, crew and service personnel, including U.S. reserve. "by law, no member of the Naval Reserve is permitted to accept employment with the government of any foreign country in a capacity which is directly or indirectly under the control of such foreign government.". Hank Greenspun carries radio equipment to Panama. Customs seizes 115 lbs of radio parts and accessories. Schwimmer's cover story of not knowing Service Airway's true purpose. DOCID-31983571.pdf .3 MB 06/24/1948 Naval Intelligence report. "Three B-17s reportedly enroute to Palestine, lad at Isla Grande airport, San Juan, Puerto Rico from Miami." It is not known where he [Charles T. Winters] procured the financial backing to set up a business company and equip same with three aircraft...The three B-17s remained at Isla Grande until early morning of 13 June, when they departed for Santa Maria, Azores. They were reported to have deported the Azores on 15 June, 1948 en route to Corica." DOCID-3193588.pdf 22 MB 09/13/1948 informant report to Assistant AG of the Criminal Division from the FBI Director forwarding Naval Intelligence. Mostly illegible. DOCID-3193590.pdf 32 MB 07/13/1948 Naval Intelligence report on aircraft, radio and other military equipment smuggling. "It is the studied opinion of one of the sources that the formation of Lineas Aeros de Panama was only a ruse to get the planes that Haganah wanted in the Near East out of the United States." List of Navy and Army /Reserve officers "of interest" for not having obtained permission to work for a foreign government. Plane forced down in Switzerland carrying guns. Cover story that combat engines were to be converted to export-qualified version; disbelieved. 32 MB 07/27/1948 Naval Intelligence Report. "Service Airways is not spending around one million dollars per day; some personnel in Czechoslovakia where it is believed that Messerschmitts are being supplied to the Jewish forces operating in Israel. This report includes a fairly complete list of employees working for the above concerns. Source: Lt Col in the U.S. Marine Corps Reserves offered in the interest of "clearing himself from any possible involvement in the operations of a concern that is operating in part, in violation of the law." 1.5 MB 08/27/1948 SAC NY report to FBI Director with 07/16/1948 Naval Intelligence report on Czechoslovakia based on letters written by Service Airways employees. "Subject Airline reputedly acquiring Czech-built Messerschmitt 109 airplanes for use in Palestine; using C-47s as bombers. One C-47 shot at over Palestine 27 June, 1948. Palestine problem includes important local Uranium deposit...."
"The Czechs are manufacturing Messerschmitt fighters for my employers and Mike and myself have been sent down here to the factory to check them over for flaws. This isn't a nice place. The police, including traffic cops are all in Army uniform. They all look nasty but don't hesitate to take bribes. Your Daddy doesn't care for Russia influenced people." "This ME-109 is supposed to be a better plane than the Spitfire that the Jikkos (Arabs) are using... "One of the boys from Tel Aviv said they are using C-47 for bombers, just opening the door and start chucking. These ME's we're getting ready will carry a 1000 lb bomb that'll set the Jikkos on their heels..."
'This war is being fought for important uranium deposits near Palestine. The English want those deposits and recently proposed to the Jews an armistice if the Jews would give up their rights to this one piece of desert. The Jews preferred to fight, and here we are." .7 MB FBI Naval Intelligence report on "Recruiting of U.S. Marine Corps Tank Personnel." 12 MB Reports to FBI of recruiting. 13 MB Report to FBI director on November 5, 1948 including crew list of "Lineas Aeros de Panama". Report, "It was conjecture that certain politicians (possibly Hermodio Arias, head of the law firm...were offered financial reward in return for shielding the illegal nature of the company's operations. 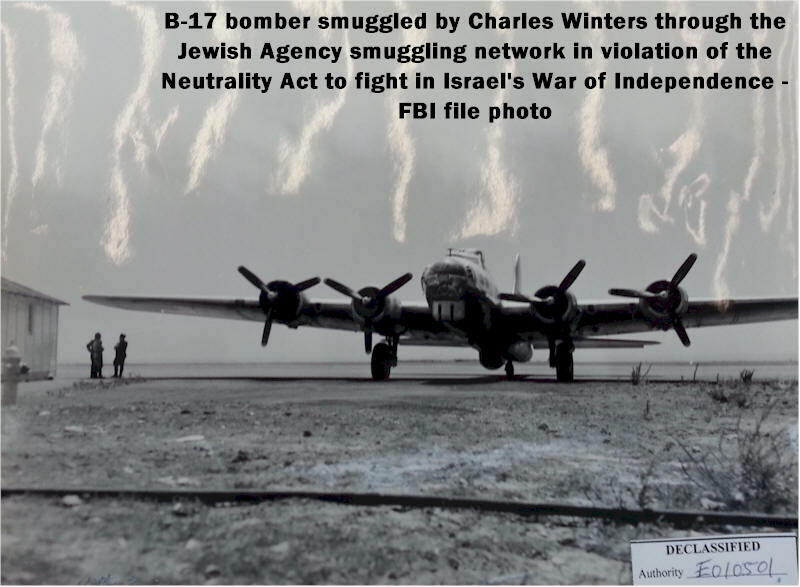 7 MB FBI receives 11/04/1948 Naval Intelligence report that "half of the highly critical aviation material being sent by TCA to Palestine is for ultimate delivery to the Soviet Government." 12.2 MB January 28, 1949, FBI receives Naval Intelligence reports of aircraft engine purchases, illegible. .4 MB Naval Intelligence report, July 14, 1950. "P-51 and other military airplane components are being purchased in Southern California for export to Israel....one source stated that there is a fund of some nine and one-half million U.S. dollars, deposited in banks in Switzerland, which came from contributions of Jewish people all over the world, however, principally from Americans...These purchases are being made piece-meal from many war surplus dealers, resulting in not a few suspicions that war material is again being brought together for export without compliance with export regulations. The persons involved locally in making the purchases are 'closemouthed', but appear to be perfectly willing to let any government agency see and know the details of their operations. They appear willing to comply with all regulations, as long as they are able to obtain export permits. It is said, however, that if permits to export were not obtainable they would then probably smuggle the materiel out.""